Ever considered a career in the IT? If you think that our job is all about installing new software or fighting malicious viruses, read on for some compelling stories. There is actually more than meets the eye. 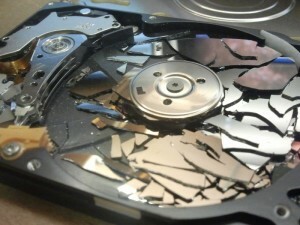 Before we start, do you think that your PC or any other data storage device is indestructible? Well, if you do, at some point you may end up realizing that you have just lost all your data, as the device got destroyed. Even despite the recent advancements in the field of data recovery, sometimes the users get just too creative. And we mean it – although we’ve been working in the IT field for quite a while and saw lots of weird things, some people do not cease to amaze us. So, we decided to compile a list of the most awesome, or just awesome, cases of data loss we had to face. Although we succeeded in most of them, sometimes that was just too difficult. Remember when your computer got lags and you were waiting forever while trying to open some important website? How about the error message popping out when you wanted to enter your company’s e-mail account? Well, we can all relate to that. Most people turn the computer off and just walk away. Indeed, this is a far better decision than hitting the PC, throwing it through the window, or even kicking it. Try to imagine, what damages you might do to your computer by doing this. It doesn’t take a rocket scientist to know that the data losses may be so huge that any recovery would be a tall order. 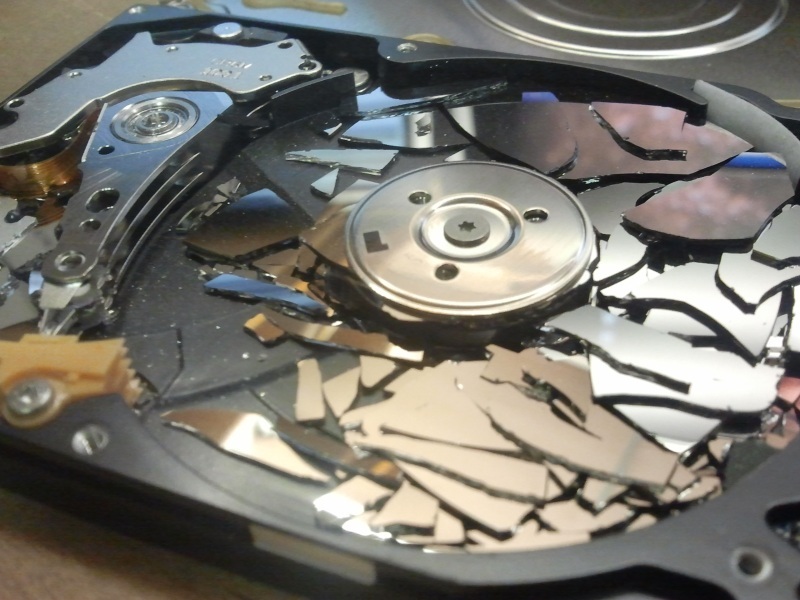 Even the best and the brightest data recovery professionals might not be able to save the data lost after a hard disk got destroyed. 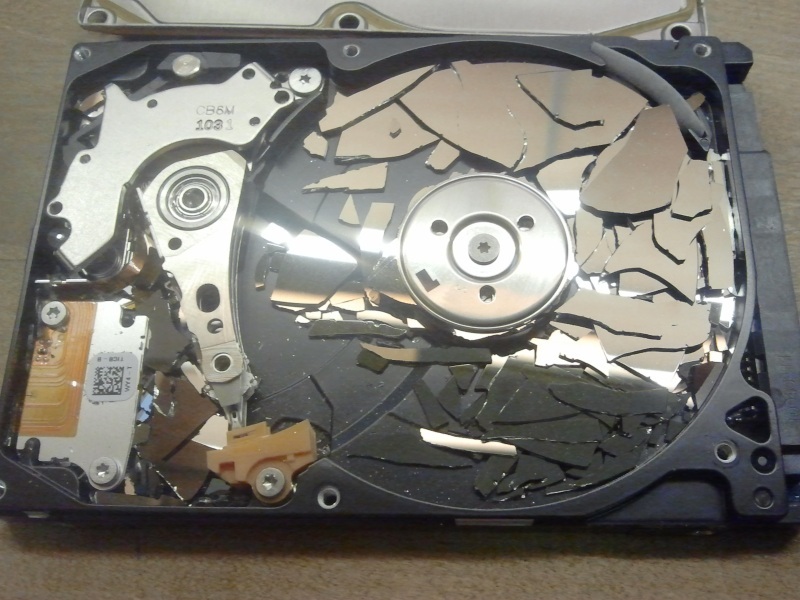 See the picture below to get the idea of what we faced and how mission impossible it was to recover the data from the totally massacred hard drive one of our hot-headed clients brought. Water appears to be another great enemy of computers. Although it’s hard to believe, there are still people that take their laptop round to the bathroom. Needless to say, the danger is close, as the PC might get wet at any point. Nothing compares to one gentleman that knocked at our door one day. He was so deeply bonded to his computer that he wasn’t able to go anywhere without it. It applied even to the time he spent chilling out in seawater. No wonder, as he was a CEO of a successful company and the computer was an essential tool for his work. With this in mind, he took the basic preventive measures and put the laptop in a plastic bag. Would you believe that the waves were stronger? Fortunately, though, we were able to recover the data lost as a result of that sea bathing incident. Meet John. Recently, he decided to make his wildest dreams come true and flew to Africa. Obviously, he took tonnes of pictures there and later saved them all on his PC’s hard disk. For some reason, John did not store them anywhere else. A few days later John’s house caught fire. To make things worse, one of the firefighters simply dropped John’s PC on the floor, while moving down on a ladder. It was by pure luck that we managed to recover all the pictures. Later, they were even featured in a brochure released by a popular travel agency. How To Repair Your PC Without Calling the IT Service? In this respect, computer users’ creativity grows to an unimaginable extent. One of our clients decided to use olive oil to recover data from his memory card. Well, we’ve been through a lot, but that was really surprising. This guy claimed that he found out about this, while googling up methods of data recovery. The hint goes as follows: if you want to fix a scratched CD, just rub it with olive oil. Our client decided that this might work out for his corrupted memory card as well. You know the rest of the story…With great difficulties we managed to recover the lost files, but the unlucky owner of the memory card just started to hate olive oil and promised he will never use it again. Even for cooking. Being in a hurry often does not pay off. Ms Brown, a senior manager in a huge corporation learned that very painfully. That Monday morning, she woke up a bit too late, so she had to do everything in haste. Before putting her baby son in the backseat of her VW Touareg, she left her laptop bag on the car’s roof. When Ms Brown started to drive out of her driveway, the bag just fell on the ground, making the last sigh, after being smashed by the VW’s giant wheels. And, yes, you guessed that – data recovery was out of the question here. Fortunately, Ms Brown had most of her work files stored on a shared server at her company PC. What a relief! So, do you still think that computer repair people have boring jobs? These stories are just a tiny excerpt from a day in the life of an average data recovery guy. Computer users get more creative all the time and I often wonder, what else is there to come. There is a light at the end of the tunnel, though – situations, where data recovery data was impossible are really rare cases.